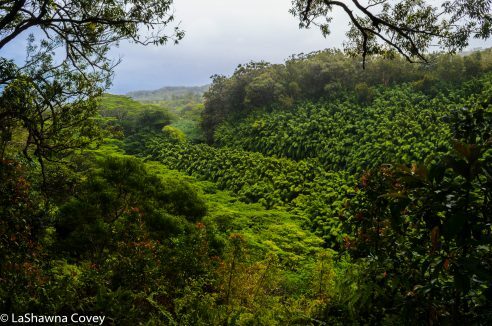 The absolutely gorgeous Hana Highway is most known for the abundance and variety of waterfalls, but there is also other beautiful nature to behold as well. 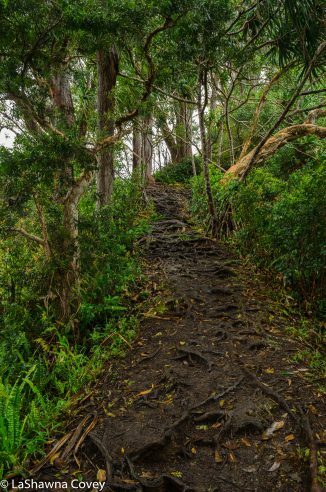 One of the first stops out on the Hana Highway was at the Waikamoi Nature Trail. It is located between mile markers 9 and 10, and there are a couple nature loops. I did these walks myself, because it was raining and Mom decided to guard the car while I got wet and sort of muddy. It wasn’t pouring down rain, but there was sort of a constant drizzle. Both trails are pretty easy, though like I said, they were a bit muddy when I visited. However, at one point, there was a nice view of the green valley (a common theme at many of the stops along the Hana Highway). Thanks to my guide book, Maui Revealed, I knew that you could walk a bit from the main trail and come to a pretty waterfall. 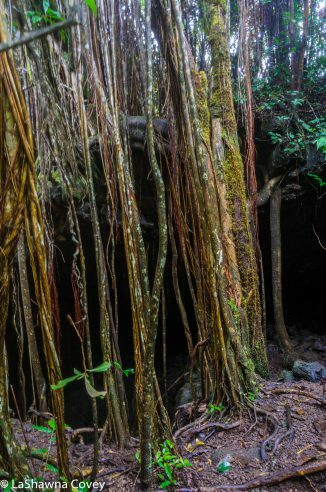 Yes, I did say that this post was going to be about everything but waterfalls, but just one more (since my Hana Highway waterfall post was just packed to the gills with them). I followed the directions in the book, where I took the longer trail out to a picnic area and then walked past the “End of Trail” sign. The book said to take the trail to the left and walk a few minutes, where it would lead to a stream an dam. I think I must have missed some critical step because I didn’t find myself where the book described. I took one path down a bit, but then it started getting super steep and slippery so I hiked back up and tried another wider path that was more like a road. I eventually did come to a nice view that overlooked the top of a waterfall, but I don’t think I was where I was supposed to be. However, the rain started picking up and we had many, many more stops along the way, so I turned back and walked to the car. 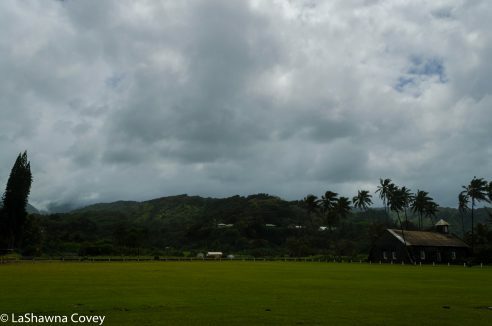 We made a stop in Ke’anae, and the turnoff road is between mile markers 16 and 17. 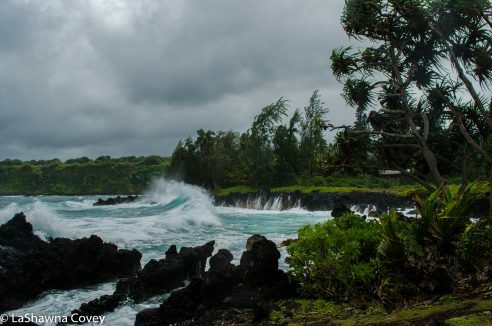 You pass a stand called Aunt Sandy’s selling pretty good banana bread and then come to the end of the road at the Ke’anae Peninsula, which opens up right onto the seas. In the past, there used to be a small village there, but thanks to a massive tsunami in 1946, all the buildings but the stone church were destroyed. However that church still remains standing to this day. 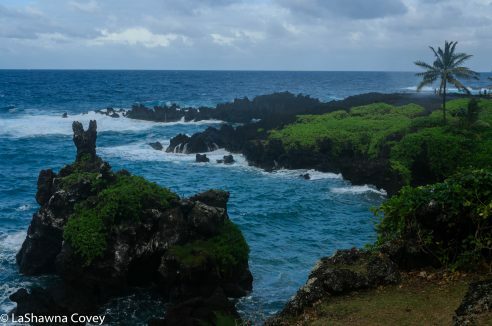 In addition, the view of the sea is absolutely marvelous from this vantage point, and the day we were there, the sea was churning mightily with some powerful waves crashing against the young lava rocks. We made a brief stop at Wailua Valley State Wayside, which is just before mile marker 19. 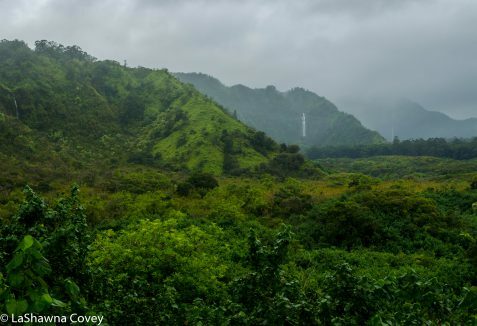 It is a short trip up the stairs, but at the top, you have a wide open view of the Ko’olau Gap with the lush green valley laid out before your eyes and a far off waterfall visible (at least at the time I visited, because it was raining). My next stop is probably the weirdest, and it is extremely easy to miss if you don’t keep your eyes out for it. 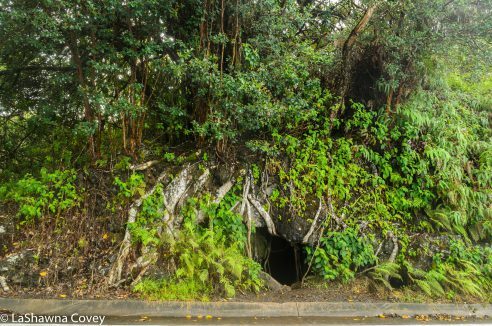 But there is a small lava tube cave just off the right (mountain side) two turnouts past mile marker 23. But if you know what you are looking for, you will spot it and know you are in the right place. Yeah, on the face of it, it might seem stupid to crawl into a hole off the side of the road when you don’t know what’s down there. But Hawaii really isn’t filled with creatures that can kill you, so you are probably safe. I crawled into the cave (make sure to bring a flashlight, because it does get dark, and there are plenty of loose rocks to fall on if you aren’t paying attention). 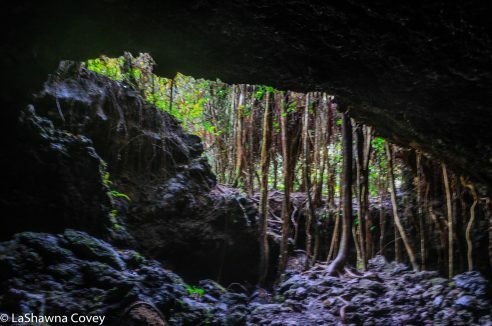 But inside, you can scramble through the 140 foot long cave and come to an opening in the forest where you can climb out and see inside. Overall, it is a different diversion and a nice break from all the waterfall beauty. 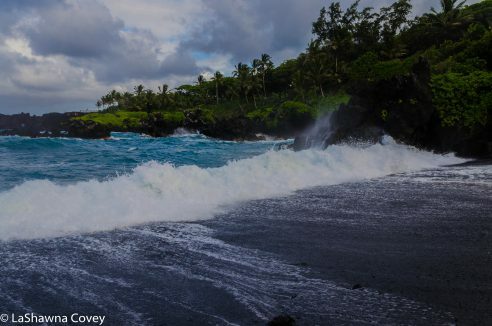 Just a few miles before you reach the town of Hana, there is a very nice beach stop at Wai’anapanapa Park. The turnoff road for the park is located just after mile marker 32. There is ample parking there, and plenty of signs for things you might want to see. 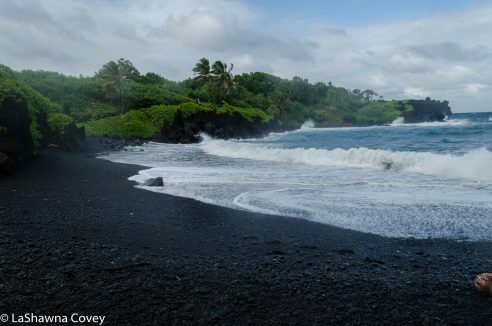 Most of our time was spent enjoying the coastal view and sort of frolicking on the gorgeous black sand beach (sort of frolicking, because the surf was pretty rough that day- even though there were a couple local surfers riding the waves out there). 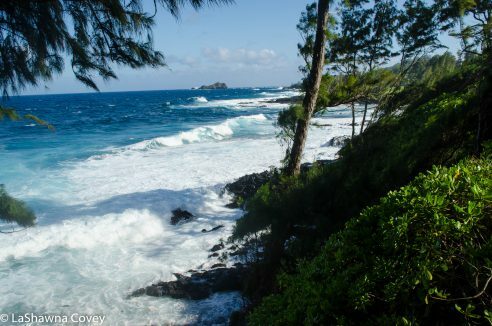 There is an easy trail that leads down to the volcanic black sand beach, known as Pa’iloa Beach and right when you get down to the beach, there is a small sea arch that looks like a cave. You can walk into it and enjoy the sea view from a different angle. 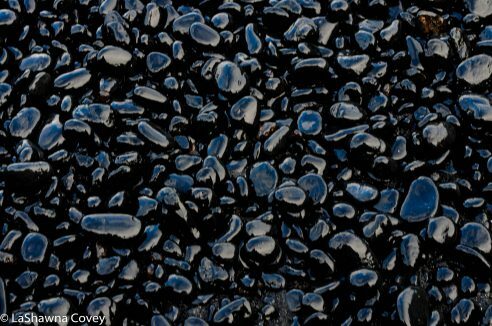 We spent some time just enjoying the texture of the beach and the beautiful black stones. We eventually left, because the tide was coming in and we were only a couple hours from sunset and we wanted to get to Hana and settle in at our inn before it got dark. But it was still amazing to witness the awesome power of the ocean crash into the beach. 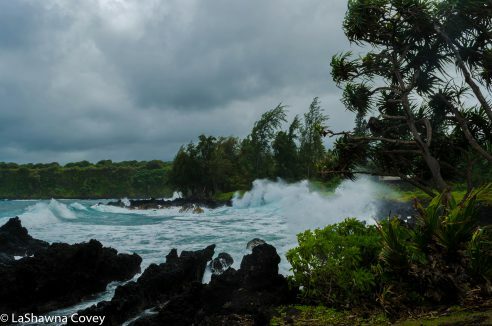 I have always had a thing for stormy beaches and crashing waves, and there was an abundance of both on this day. The town of Hana is small, but nice. There aren’t THAT many hotels out there (since most tourists do the Hana Highway as a day trip), and most the hotel rooms are sort of inn rooms or Air BnB type rooms in someone’s house. Our particular inn room was very nice with an outdoor shower, which is one of my favorite things when visiting the tropics. We got up early the next morning to head out to Haleakala National Park for some hiking and waterfall viewing (subject of my next blog post), but we had a nice sunny morning to start the day in Hana. If you have the time, I would highly recommend staying overnight at Hana. 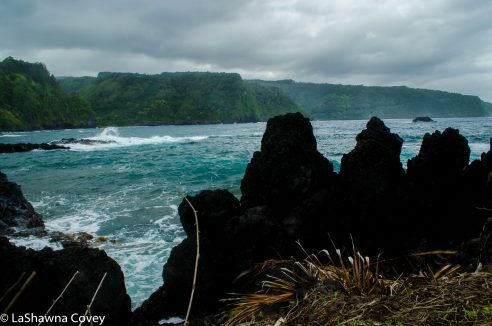 It gives you that much more time to stop and see the numerous beautiful sights on the Hana Highway. It allows you to really enjoy the scenery rather than just zooming by it or just taking a minute, because you have a packed itinerary to complete in a day. It is also likely to help you avoid the crush of the tourists. 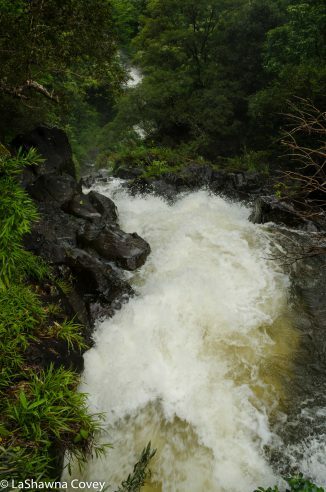 Overall, I think taking your time on the Hana Highway will allow for a deeper traveling experience. 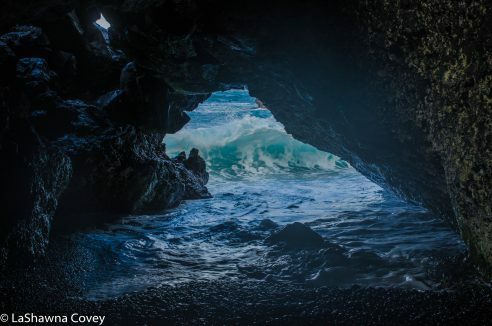 This entry was posted in Photography, Travel and tagged black sand beach, coastal views, Hana Highway, Hawaii, Highway 360, Ke'anae Peninsula, Ko'olau Gap, lava cave tube, Maui, Pa'iloa Beach, Road to Hana, Wai'anapanapa Park, Waikamoi Nature Trail, Wailua Valley State Wayside.